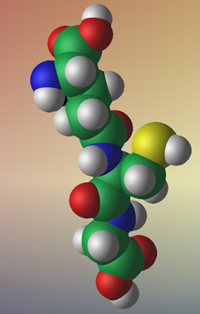 Glutathione (GSH) is an enzymatically derived intracellular tripeptide: γ-glutamyl-cysteinyl-glycine: γ-glu-cys-gly or γ-ECG. It is produced by ligation (γ-glutamylcysteine synthetase, EC 6.3.2.2) of the gamma-carboxyl of glutamate (E) to the amino group of cysteine (C), then terminated by glutathione synthase (EC 6.3.2.3), with a conventional cysteine-glycine (C-G) peptide bond. Most taxa express GSH. It is universal amongst the Animalia and in most Plantae and Fungae, and common in Protozoans (Protoctista). GSH is expressed by some Bacteria (e.g. Chesney et al. 1996) but apparently not by the Archaea. Many prokaryotes appear to lack GSH synthesis and alternate thiols such as CoA-SH and γ-glutamyl-cysteine act as GSH surrogates (Newton and Javor, 1986; McFarlan et al., 1992). The absence of GSH in these organisms does not imply lack of thiol regulation, but reflects the complex evolution of GSH-based cytoprotection strategies. What are the cellular roles of glutathione? 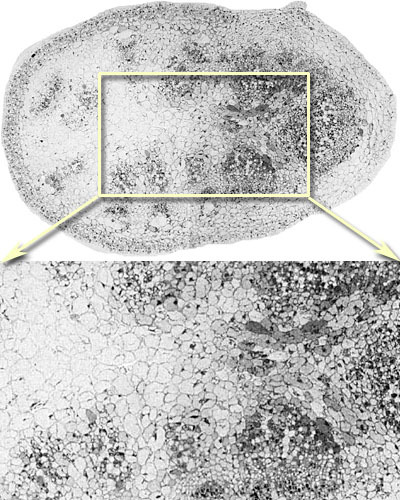 Cellular GSH acts as a cytoprotective species via (i) its ability to provide thiol reducing equivalents in metabolic reactions and preserve a millimolar-scale reduced-thiol cytoplasmic milieu; and (ii) its ability to quench reactive oxygen species (ROS) such as superoxide and hydrogen peroxide as well as toxic aldehydes. Amino acid transmembrane transport driven by GSH cleavage (γ-glutamyl transpeptidase, γ-GT) provides a complex mechanism for amino acid transport, storage and thiol recycling (Allison and Meister, 1981; Mehdi et al., 2001). Finally, the most complex form of cytoprotection involves the action of glutathione-S-transferase (GST), that is able to mediate GSH coupling via the SH group to a vast array of ROS and xenobiotics. The level of GSH in a cell is a measure of cellular net-reduced oxidation state - the ideal state for most biological chemistry. As the cell becomes more oxidizing, thiols (SH) form dithiols (S-S) and GSH → GSSG. Under normal conditions, however, the GSH:GSSG ratio is high (> 10). It is generally believed that vertebrate cellular GSH levels are typically in the 1-5 mM range. However, GSH is an extremely dynamic molecular species and can be rapidly depleted by γ-GT export and cleavage. Furthermore, GSH levels can change with cell cycle, oxidation level, and, in most complex heterocellular systems (vertebrates), different cell classes express very different GSH levels. Indeed, some cells may synthesize little GSH and depend on coupling, transport or other cell types to provide local ROS regulation. In other words, cells vary in their ability to produce GSH. Thus metabolomic profiling of biofluid and tissue homogenate GSH levels are difficult to interpret. Cellular resolution is needed. In brain and retina, different cell types express diverse GSH levels, as revealed by high-resolution mapping with glutathione-specific IgG probes (Hjelle et al. 1994; Pow and Crook, 1995; Marc and Cameron, 2002). In the zebrafish retina (Marc and Cameron, 2003), GSH reaches 5-10 mM levels in retinal pigmented epithelial cells and about 1 mM in Muller glia. 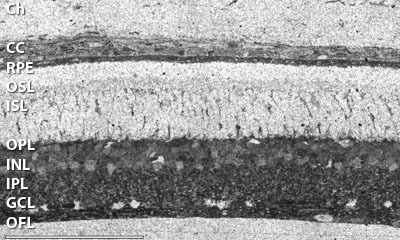 Moderate levels (<1 mM) are expressed in the endothelium of the choroidal rete and higher levels in the choroidal melanocytes. Glutathione levels are immeasurably low in photoreceptor outer segments however. This diversity is also seen in mammalian retina (Fig. 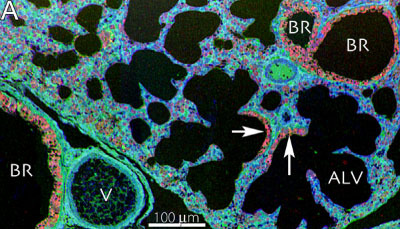 1) and non-neural tissues such as mouse lung (Fig.2) (Jean et al., 2002; Joyce-Brady et al. 2002). In general, GSH levels are high in transport epithelia and vascular endothelia, hepatocytes, but low in myocytes and neurons. Cellular and subcellular heterogenity of GSH levels is also evident in plants, such as Arabadopsis thaliana, Fig. 4. Fig. 1. Rat retina. Glutathione visualized with Signature Immunologics J100 IgG and 1.4 nm immunogold-silver imaging on a deplasticized 200 nm thick resin section. The tissue is fixed and processed according to (Marc and Jones, 2002). The scale bar is 100 um. Image courtesy of the Marc Lab, University of Utah. The image is displayed with no post-processing (i.e. no contrast adjustment). Images were captured at 73 nm/pixel. Fig. 2. Mouse lung. Glutathione visualized with Signature Immunologics J100 IgG in a glutatione::taurine::glutamate → rgb mapping (See Marc and Cameron, 2003 for methods; also see Jean et al. 2002). BR glutathione rich bronchiolar modules, ALV alveolar modules, V vascular modules. Arrows, transitional BR ? ALV zones. Arabadopsis thaliana stem cross section visualized with Signature Immunologics J100 IgG and 1.4 nm immunogold-silver imaging on a deplasticized 250 nm thick resin section. Fixation: 200 mM glutaraldehdye, 333 mM paraformaldehyde in 0.05 M phosphate buffer. Note the extremely high glutathione levels in intracellular peroxisomes. What are the health-related aspects of glutathione? Glutathione is the major water soluble antioxidant of metazoans. When ROS levels elevate, lipophilic antioxidants cannot protect the cytosol - a hydrophilic antioxidant is needed: GSH. While glutathione function and metabolism is of widespread interest in virtually every biomedical arena, it has become the focus of particular concern in cancer biology. For example, glutathione-S-tranferase gene polymorphisms confer reduced risk in pancreatic cancer (Jiao et al., 2007). How this polymorphism acts to decrease risk is unknown, but it is consistent with idea that GSH is generally a protectant for stressed cells. However, the health-care value of antioxidants is often hyped. GSH is a non-prescription antioxidant that is cheap to produce in pure form. As a result, oral glutathione,oral formulations of the GSH pro-precursor N-acetylcysteine, and certain cysteine-rich foods (whey extract) have been touted by commercial and non-professional health information websites for a vast array of health problems (autism, alcoholism, cardiac dysfunction, cigarette addiction, drug addiction, infertility, obesity, prostatic enlargement, sexual dysfunction, sleep disorders, vision defects, HIV, infectious disease and so on). It is true that certain immune cells depend on GSH for self-protection from their own cytotoxic mechanisms, and that cell stress seems to upregulate GSH machinery. But it is not clear that in vivo functional GSH levels are easy to boost. GSH seems to be a safe dietary supplement, likely because it is poorly transported and rapidly digested by peptidases. The jury is still out on N-acetylcysteine, but there is little evidence that GSH deficiency is a problem for most people or that it is possible to change cellular levels much outside culture systems. More cell biology would seem to be in order to address these issues. Allison RD, Meister A 1981 Evidence that Transpeptidation is a Significant Function of γ-Glutamyl Transpeptidase. (1981) J Biological Chemistry 256: 2988-2992. A CLASSIC. Chesney JA, Easton JW, Mahoney JR 1996 Bacterial Glutathione: a Sacrificial Defense against Chlorine Compounds. J Bacteriology 178: 2131-2135. Hjelle OP, Chaudhry FA, Ottersen OP 1994 Antisera to glutathione: characterization and immunocytochemical application to the rat cerebellum.Eur J Neurosci. 6:793-804. Jean JC, Y Liu, LA Brown, RE Marc, E Klings, M Joyce-Brady 2002 Gamma-glutamyltransferase deficiency results in lung oxidant stress in normoxia. Am J Physiol Lung Cell Mol Physiol 283: 766-776. Jiao L, Bondy ML, Hassan MM, Chang DZ, Abbruzzese JL, Evans DB, Smolensky MH, Li D. 2007 Glutathione S-transferase gene polymorphisms and risk and survival of pancreatic cancer. Cancer 109:840-848. Jones BW, CB Watt, JM Frederick, W Baehr, CK Chen, EM Levine, AH Milam, MM LaVail, RE Marc 2003 Retinal remodeling triggered by photoreceptor degenerations. J Comp Neurol 464: 1-16. Joyce-Brady M, RE Marc, JC Jean 2002 The importance of gamma-Glutamyl transferase in lung glutathione homeostasis and antioxidant defense in Thiol Metabolism and Redox Regulation of Cellular Functions (Pompella et al. Eds) IOS Press, 182-196. Marc RE and D Cameron 2002 A molecular phenotype atlas of the zebrafish retina. J Neurocytol. 30: 593-654. Marc RE and BW Jones 2002 Molecular phenotyping of retinal ganglion cells. J Neurosci 22:413-427. McFarlan SC, Terrell CA, Hogenkamp HP. 1992. The purification, characterization, and primary structure of a small redox protein from Methanobacterium thermoautotrophicum, an archaebacterium. J. Biol. Chem. 267:10561–10569. Mehdi K, Thierie J, Penninckx MJ. (2001) γ-Glutamyl transpeptidase in the yeast Saccharomyces cerevisiae and its role in the vacuolar transport and metabolism of glutathione. Biochem. J. 359: 631-637. Meredith MJ, Williams GM 1986 Intracellular Glutathione Cycling by γ-Glutamyl Transpeptidase in Tumorigenic and Nontumorigenic Cultured Rat Liver Cells. J Biological Chemistry 261: 4986-4992. Newton, G. L., and B. Javor. 1985 γ-glutamylcysteine and thiosulfate are the major low-molecular-weight thiols in halobacteria. J. Bacteriol. 161: 438-441. Pow DV, Crook DK. 1995 Immunocytochemical evidence for the presence of high levels of reduced glutathione in radial glial cells and horizontal cells in the rabbit retina. Neurosci Lett. 193:25-28.